Regardless of where one is in Austin or in Texas altogether, getting arrested for a driving under the influence (DWI) violation is a serious matter. The State of Texas, as well as the federal government, have added onto certain DWI crime laws what are called enhancers - added penalties to DWI crime laws and their punishments. The intent has been, obviously, to remove as many drunk drivers as possible from public highways and roads. However, because these laws are so broad and unforgiving, there is often little or no distinction between someone who is a repeat offender and should be punished severely and someone who makes a dumb mistake but is otherwise a good citizen and community member. If a person is arrested for a DWI, the justice systems seeks to charge the matter as a felony as much as harshly as possible with the more severe outcomes. For those who have made the mistake of driving under the influence and has been charged with a DWI in the past and then find themselves in a similar situation again while driving, the penalties end up being far more severe than the initial infraction. Second, third, and subsequent DWI charges all aggregate, with old records being brought up in court, when penalized again. After a first offense the fines grow exponentially and increasingly long incarceration times begin to range from a year or longer, depending on the nature of the court at the time. In addition to the monetary fines and potential jail time in serious cases, a DWI driver will also be inundated with administrative penalties as well. The charge creates an automatic suspension of one's driver license in Texas. Not only is one completely inconvenienced in realizing just how much free access to a vehicle impacts one’s life, then one has to go through the hassle of requesting an occupational license just to drive to work and back. Interestingly, this problem can be reversed, but only in the first fifteen days after arrest, which is a nuance in Texas law most drivers are not informed of. However, quality DWI attorneys know this rule very well. For those who drive for a living, the fifteen-day window is a critical juncture because it literally signifies the ability to keep one's source of income or lose it completely until trial. And with more and more drivers who sign up for services like Uber and Lyft for extra needed income, they fall into the same risk as well. For those who are young drivers, particularly under the age of 21 years, a DWI can be a particularly threatening to one’s success in life. Not only does one go through all the penalties and the loss of driving privileges, the stigma on one's driving record can affect the ability to get hired. And, it does not matter if like a criminal when applying for a job in comparison with other candidates with a clean file. The problems do not stop with a conviction and the initial penalties mentioned above. Up to three years after a conviction, a DWI driver has to pay a surcharge annually from the conviction date. These surcharges add onto each other and are often set by local jurisdictions. And if a driver fails to pay in a timely fashion, it can trigger a second loss of one's driver's license. So, the expense of a DWI can run into the thousands of dollars easily. Who is the Number One DWI Attorney in Bastrop, Texas? 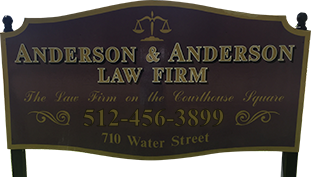 The best chance to mitigate the repercussions of your DWI charge is to call the best experienced DWI lawyers in Austin—the Anderson & Anderson Law Firm. Their skill and depth of experience at criminal defense in DWI cases is unmatched by many, and that's a critical factor when a defendant seeks to keep his or her license and keep penalties to a minimum. Not every DWI charge can be dismissed, but their effects can be reduced dramatically with a good DWI attorney in Bastrop County.